Mare is a hometown girl from Fairvew, New Jersey working in her brother’s law office. She longs for adventure and travel. After a long night of talking with her brother and a British Spy Recruiter, Marie is on her way to spy boot camp on an overnight train from New York to Toronto. At a stop in up-state New York the news is the United States is at war, Japan has bombed Pearl Harbor. The game is on. Does she have the courage and stamina to continue? Will she ever see her lover again? Meet Marie at Amazon, Kobo, Smashwords etc. Print book , ebook or audio book all available at Amazon and ready for gifting to your favorite reader this Holiday Season. US military policemen read about the German surrender in the newspaper Stars and Stripes. My Metaphysical Theory of Me: I am fascinated with stories of WW II. One of my theories about my fascination is maybe because I was born in 1942. Things were heating up in Europe. In France the Nazies separated 4,000 Jewish children from their mothers. The fathers had been sent away before then. The mothers were sent to one camp. The children were left alone to fend for themselves. In August all 4,000 were rounded up and shipped East to the death camps. I was born at the beginning of August, 1942. Maybe my soul belonged to one of them. My Blessing from WW II: My Father would have been a soldier in the U.S. Army, but after he was drafted he was discharged due to his flat feet. He was saved by his feet. Who would have thought flat feet was to be such a blessing. He was a barber and after being discharged, he gave free haircuts to every GI who walked into the shop. He stood on his feet for 8-10 hours a day and some nights could not relieve the aches. He is my WWII hero. If he had not been discharged, I might not even be here. I would have been conceived and born at a different time and place. Victory in Europe Day, generally known as V-E Day, VE Day or simply V Day was the public holiday celebrated on 8 May 1945 (7 May in Commonwealth realms) to mark the formal acceptance by the Allies of World War II of Nazi Germany‘s unconditional surrender of its armed forces. It thus marked the end of World War II in Europe. The term VE Day existed as early as September 1944, in anticipation of victory. On 30 April 1945, Adolf Hitler, the Nazi leader, committed suicide during the Battle of Berlin. Germany’s surrender, therefore, was authorised by his successor, ReichspräsidentKarl Dönitz. The administration headed by Dönitz was known as the Flensburg Government. The act of military surrender was signed on 7 May in Reims, France and on 8 May in Berlin, Germany. After regaining their independence from the Soviet Union, the Baltic countries now commemorate the end of World War II on 8 May, the Victory in Europe Day. In the Ukraine from 2015, 8 May was designated as a day of Remembrance and Reconciliation, but it is not a public holiday. For the celebration in the former Soviet Union, see Victory Day (9 May). Winston Churchill waves to crowds in Whitehall, London on the day he broadcast the news that the war with Germany was over. 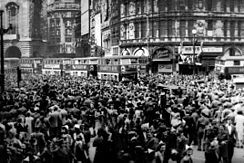 Crowds gathered in celebration at Piccadilly Circus, London during VE Day in 1945. The instrument of Germany’s surrender signed at Reims, France on 7 May 1945. Thanks for following me. You can leave your comments here of on my Facebook page. The Relentless Brit on Amazon http://amzn.to/1T8Xphm A WWII Love Story of a British spy and a young American widow. The Relentless Italian on Amazon http://amzn.to/1JhO7PG A 1960’s Love Story of an Italian Celebrity, and Veterinary student on two continents and an ocean apart.